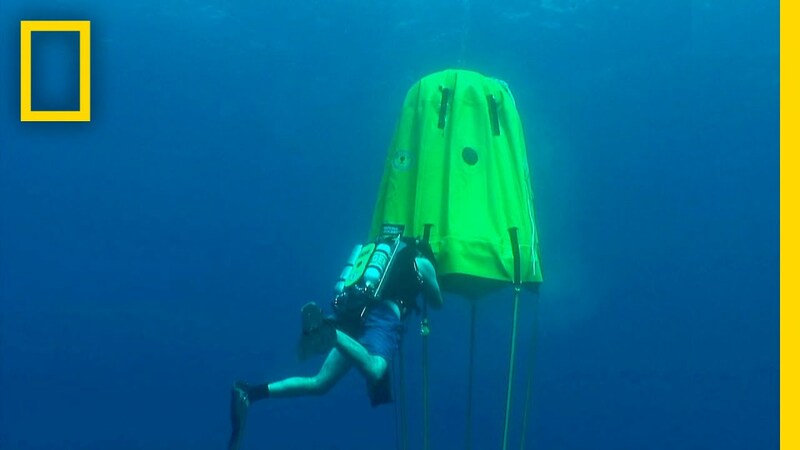 National Geographic explorer, Michael Lombardi has recently designed and patented what he calls an inflatable Ocean Space Habitat for scuba divers. The Ocean Space Habitat is designed to serve as a portable life-support system for scuba divers that need to dive deeper and stay down longer. The idea is to provide a safety stop down near the dive site to alleviate the need to resurface before completing what could now be considered their extended dive plan. Using a conventional self-contained underwater breathing apparatus (SCUBA) comes with several constraints. For one, deeper dives mean shorter amounts of time on the sea floor since the human body consumes air faster as it moves deeper. And surfacing safely requires a lengthy wait at various depths to acclimate to the changing pressure. An improper ascent can cause decompression sickness or “the bends,” when gas bubbles build up in the blood and tissues. And reaching a hyperbaric chamber to treat the dangerous condition can be difficult and expensive. Watch the video below for a full explanation and demonstration of how this device helps divers stay at depth longer. Jennifer Hayes, an underwater photographer with National Geographic, points out that this device could really service its purpose in really remote dive sites. Getting bent at dive sites can be a fatal occurrence where there is a the lack of nearby emergency facilities. Ok, so with all of that being said, it reminds me of a post we did a while back called “A DIY Underwater Air Bubble Room”. In this post a DIY-er actually demonstrates how to make a very similar habitat as a DIY project.